Wireless technologies have revolutionized the way we communicate and exchange data. Mobile radio communications have become ubiquitous over the last few decades and mobile communication technologies have become a normal part of urban environment in which people live. There’s a whole lot of other mobile radio applications used in navigation, broadcasting, transportation, space exploration, military applications and so on, with each application being developed for specific needs. However, the underlying principles in mobile communications remain the same in many applications. That being said, Global System for Mobile Communications, or GSM, is still the most popular wireless technology in widespread use and is not expected to change anytime soon. Despite constant evolution, the mobile communication systems have reached a number of inherent design limitations in a manner similar to GSM at the end of the 1990s when the number of mobile subscribers increased tremendously. And the growth has been fueled by low-cost mobile phones and efficient network coverage. The Third Generation Partnership Project (3GPP) hence decided to redesign both the radio network and the core network. And the result is commonly referred to as “Long Term Evolution” or LTE for short. LTE is the next generation of wireless technology for cellular mobile communication systems. GSM is a digital network and the most popular mobile communication standard widely adopted by the mobile phone users in all over Europe and the rest of the world. In 1982, the European Conference of Postal and Telecommunications (CEPT) set up a committee known as Groupe Special Mobile (GSM), later known as the Global System for Mobile Communications. The idea was to define a mobile system that could be implemented across Europe in the 1990s. The GSM project was handed over to the European Telecommunications Standards Institute (ETSI) in 1989. The GSM initiative finally gave the European telecommunications industry a home market of around 300 active million subscribers. One of the reasons why GSM achieved such a tremendous fame in a few years was because it was a complete mobile communications network making it the de-facto standard for mobile communications. 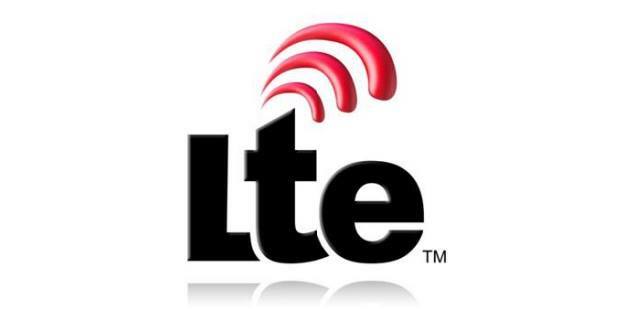 LTE is the de-facto mobile communications standard for high-speed wireless broadband technology for mobile devices. The term LTE is actually a project name of the Third Generation Partnership Project (3GPP), the organization responsible for defining GSM and UMTS standards. The idea was to determine the long-term evolution of 3GPP’s Universal Mobile Telephone System (UMTS), which was also a 3GPP project. To overcome the design limitations of the UMTS standard in a manner similar to GSM and GPRS at the end of the 1990s, the 3GPP decided to redesign both the radio network and the core network, which gave rise to the LTE standard, which became part of the official 3GPP Release 8. – GSM is the so-called second-generation (2G) cellular mobile phone system and the most popular mobile communication standard. It was developed to create a uniform, open cellular mobile network standard which could be implemented in the 12 countries of the European Common Market. LTE, on the other hand, is the de-facto mobile communications standard for high-speed wireless broadband technology for mobile devices. LTE is actually a project name of the Third Generation Partnership Project (3GPP), the organization responsible for defining GSM and UMTS standards. –GSM technology is a combination of Frequency Division Multiple Access (FDMA) and Time Division Multiple Access (TDMA). Each carrier frequency is then divided into eight time slots and to setup a GSM connection, each user is assigned a pre-defined frequency channel and a time slot in which the signal can be transmitted or received. LTE uses Orthogonal Frequency Division Multiplexing (OFDM) as the signal bearer and the associated access schemes, Orthogonal Frequency Division Multiple Access (OFDMA) and Single Carrier Frequency Division Multiple Access (SC-FDMA). – GSM system frequencies include two bands at 900 MHz and 1800 MHz commonly referred to as the GSM-900 and DCS-1800 systems. FDMA is used to divide the 25 MHz of bandwidth into 124 carrier frequencies with channel widths of 200 KHz each. Each carrier is then divided into eight time slots using the TDMA technique. For DCS-1800, there are two sub-bands of 75 MHz in the 1710-1785 MHz and 1805-1880 MHz ranges. 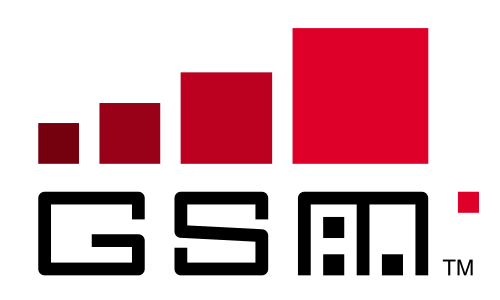 There are several frequency bands specified for LTE in different countries with each band allocated a number and have set limits. The frequency bands 1 to 25 are reserved for FDD, whereas LTE frequency bands 33 to 41 are for TDD. – The GSM system architecture is made of three major subsystems: base station subsystem (BSS), core network (CN), and the user equipment (UE). The interfaces between particular elements of the system are defined and they determine rules for cooperation between devices. LTE has a flat architecture which stems from the system architecture of the previous generation, namely from UMTS. The Evolved Packet Core (EPC) LTE architecture in the Release 8 has the following core elements: eNB (E-UTRAN Node B), eGW (access gateway), MME (Mobile Management Entity), and UPE (User Plane Entity). In a nutshell, GSM and LTE are the two basic technologies used in mobile phones and while GSM is shorthand for conventional radio communication systems in mobile phones, LTE represents a next generation of wireless technology for cellular mobile communication systems. GSM supports both cellular and data, whereas LTE is synonymous with high-speed wireless broadband technology that supports only data. This is why most of the new cell phones use LTE for high-speed internet access and rely on GSM for voice calls. Wireless technologies like LTE have great advantage of being able to offer personal broadband access independent of the user’s location. Sagar Khillar. "Difference Between LTE and GSM." DifferenceBetween.net. 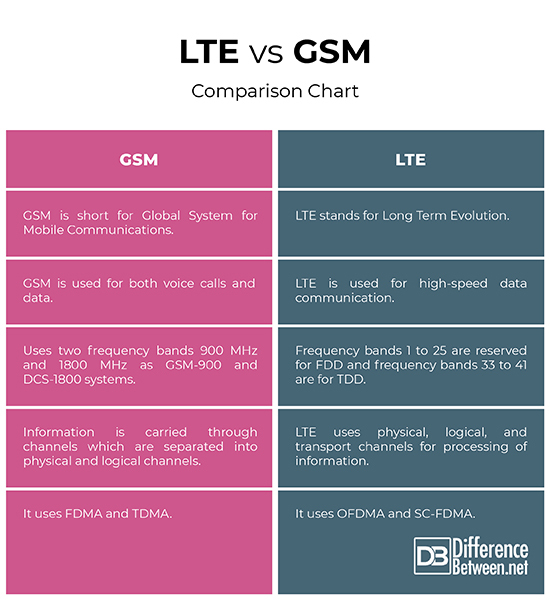 February 11, 2019 < http://www.differencebetween.net/technology/difference-between-lte-and-gsm/ >.